Government Buries Weather Modification News? The government didn't quietly admit to modifying weather in California; cloud seeding is a well-documented effort to counteract the effects of drought (and isn't related to chemtrails). The government buried news of weather modification in the classifieds section of a small newspaper. The Los Angeles Department of Public Works (DPW) placed classified ads in the Pasadena Star News in early 2016 notifying locals about upcoming cloud seeding equipment installations. The only way residents could learn of the program was via a hard to find classified ad; the media ignored the announcement; cloud seeding is a shadowy and sinister form of weather modification somehow linked to chemtrails. … the level of propaganda and indoctrination that the average American must wade through in order to get the smallest amount of Truth is staggering. We have reached a point in which Americans are so overwhelmed with the current battle taking place between the Alternative News community and mainstream media, and its barrage of contradicting “Facts,” that most have simply chosen to completely remove themselves from any critical thinking. Even when the government itself reveals an age-old lie to be true, most are so indoctrinated with the idea of the “conspiracy” that they convince themselves that the revelation is just another trick of those deceptive “conspiracy theorists.” … A perfect example of this is weather modification. Obviously the appropriate area of the paper to release such a controversial topic is the classifieds, where it will no doubt be noticed by all. Sarcasm aside, it is clear they did not want anyone to take notice of this declaration of weather manipulation that has been fervently denied up until last year. Yes, since in the 1950’s the County of Los Angeles has conducted cloud seeding activities in order to augment local water supplies. When there is abundant rain or major fires affect the targeted watersheds, cloud seeding is temporarily halted. Public Works last had a cloud seeding contract in 2009 with North American Weather Consultants, Incorporated. A Public Notice of the Draft Mitigated Negative Declaration (DMND) was published in the Los Angeles Daily News, Los Angeles Times, Pasadena Star News, and San Gabriel Valley Tribune newspapers on July 24, 2009. Copies of the DMND were also sent to 8 cities and 11 local libraries … A Notice of Intent was published in the San Gabriel Valley Tribune, Pasadena Star, and Los Angeles Daily newspapers from January 22 through February 5, 2016. There is no evidence of any connection between cloud seeding and chemical trails (chemtrails). Atmospheric scientists use the term “contrails” which are defined as trails of condensed water vapor created by an engine at high altitudes. These trails are the result of normal emissions of water vapor, carbon dioxide, and some carbon-containing particulates. Contrails are normally observed on otherwise clear days, when cloud seeding would not be conducted. Cloud seeding sources do not produce such visible clouds. Per the original blog post (which gained additional traction via the unreliable Facebook page “The Mind Unleashed”), government officials sought to hide the cloud seeding initiative by placing news of it in a single classified ads section. However, the DPW stated that the same ad appeared in multiple Los Angeles-area newspapers. First, the story wasn’t restricted to the classifieds. 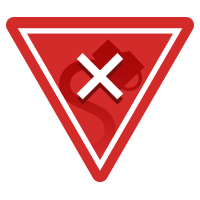 On the same date the blog post was published warning of this secret classifieds-only initiative CBS News covered cloud seeding in Los Angeles, as did KNSD and Gizmodo (on 9 March 2016); The Weather Channel (on 10 March 2016) KCAL (on 11 March 2016); and the Los Angeles Times (all the way back on 8 March 2016). Moreover, the claim that the government “fervently” denied such programs until the 2016 classified ad appeared was easily proved false. The National Center for Atmospheric Research and University Corporation for Atmospheric Research (NCAR and UCAR) published a fact sheet in 2008, Scientific American and U.S. News and World Report covered cloud seeding in 2009, ABC News reported on it way back in 2002, and the Texas Department of Licensing and Regulation (TDLR) released a fact sheet in 2001. It would be difficult for anyone with a consistent interest in cloud seeding to miss news and information published widely over the years; the conspiracy’s core claims relied on an audience that was to-date unfamiliar with the practice wholesale. 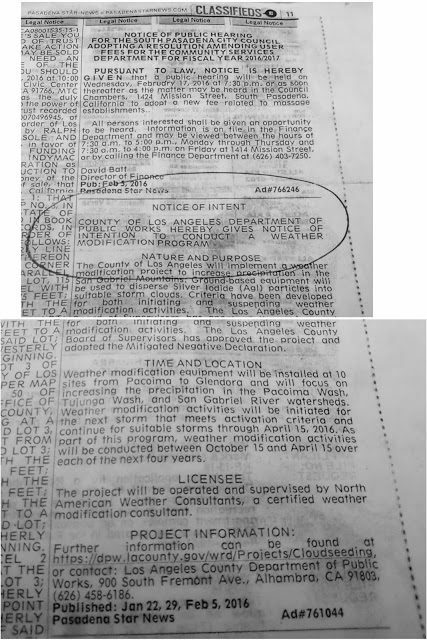 So while it was true Los Angeles’ DPW announced cloud seeding plans via classified ads in early 2016, the disclosure was neither “quiet” nor novel in 2016; cloud seeding in the area occurred intermittently and openly beginning in the 1950s. Moreover, the 12 March 2016 blog post claiming that the program was a subtle admission (validating long-held suspicions) neglected to mention widespread media coverage across several high-profile sites in the days prior to its publication. Focusing on one of several classified ads provided the inaccurate impression that the program was largely secretive in nature, but information was easily obtained via both the DPW’s web site and in contemporaneous news coverage.